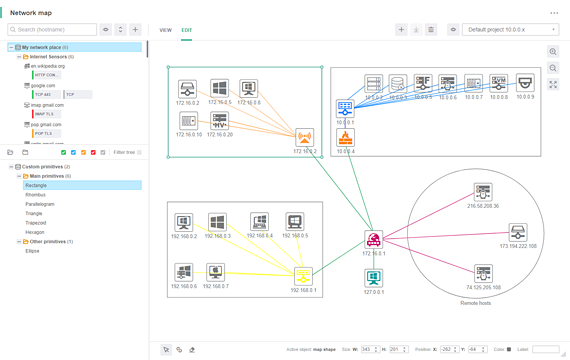 The Network map widget is located on the corresponding dashboard and allows you to create graphical representations of various network infrastructure and manage them by creating and editing map projects. The map can also be used to monitor the sensor states. You can switch between the modes using the widget's main toolbar. Map edit area where graphical objects can be arranged to form a network map. Open the context menu in this area to manage the project. switch between the existing projects. To the right of the map you can find the buttons that allow to zoom the map. The bottom part contains the toolbar for editing various graphical objects on the network map. For more information, see Creating and editing the map. In the main area, the network map of the selected project is displayed. To change the way that the graphical objects are displayed, use the Visualization mode menu located on the upper toolbar (regardless of the selected mode). select how links are displayed (line, step or spline interpolation). select which of the device properties will serve as the caption for map nodes when their display is turned on. You can select from the following properties: network names, IP addresses, MAC addresses, aliases. 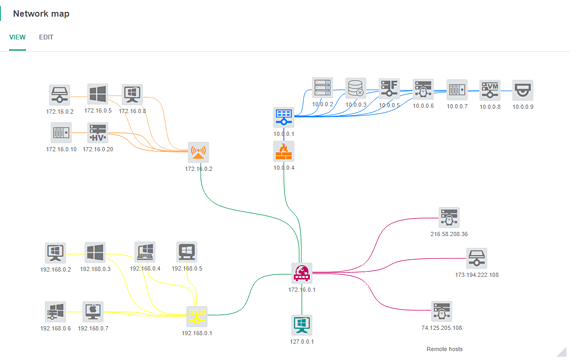 The widget's main area is used to view or edit the network map. For convenience when working with the map, both modes allow to zoom and navigate the map. To navigate the map, click and hold somewhere in the empty map space and drag it in the desired direction. To alter the zoom level, use the mouse wheel or buttons +/– on the right side of the map. Between these two buttons is another button that restores the default view and zoom level.